100 Weeks Of Perfect Picture Books! (Celebrated In The 101st Week!) – I Am Cow, Hear Me Moo! PLUS PRIZES! 100 weeks of fabulous picture books with resources of all kinds to make them easy for parents and teachers to use at home and in the classroom! 100 weeks of highly recommended books listed alphabetically and by theme to make it easy for gift-givers to find the perfect picture book for that special little someone! 100 weeks of perfect examples that we, as writers, can study and learn from! To date, we have picture books listed in 226 themes/categories. And we have – get this! – 2055 Perfect Picture Books on our list!!! So really, after all the hard work you guys have put in, all the wonderful picture books and resources that are now available to teachers, parents, writers, and gift-givers everywhere, I think we should celebrate!!! 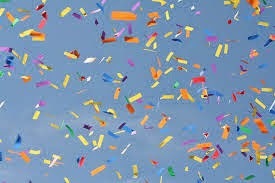 Next, we need streamers. . .
. . . confetti. . .
. . . and balloons! And last but not least, we need prizes for all the amazing bloggers who have contributed so devotedly week after week to this effort! So let’s do today’s Perfect Picture Book, and hopefully by then I will have thought up a plan. I’ll meet you down below after you’re done reading about this delightful book! Title: I Am Cow, Hear Me Moo! Opening: “Nadine was a truly remarkable cow. There was nothing she feared – so she claimed, anyhow. Links To Resources: this book will give parents and teachers a great opportunity to have discussions about what courage is, and what makes a person brave. Is it not being afraid? Or is it going forward in spite of your fear? It will also give an opportunity to talk about honesty. Is is okay to lie if it ends up being the truth? Is it okay to let people believe something good about you even if it’s not exactly deserved? Talk with kids about things they’re afraid of. What do they think could make them feel braver? Ask kids if they’ve ever lied about something and gotten caught? How did they feel? Classroom Activities: Honesty, Classroom Activities: Courage. Why I Like This Book: Nadine is so full of herself, so spunky and fun, and so believable because haven’t we all met kids (or adults :)) who can bluster their way through just about anything?! Kids will relate to this confident bovine who pretends not to be scared of the Deep. Dark. Woods. only to discover that she really isn’t afraid… until the sun goes down! Things unravel a bit (I don’t want to spoil it :)) but she ends up saving her friends (completely by accident) and is hailed as a brave hero… an illusion she chooses not to discourage 🙂 The art is lively and entertaining, and the story is fun and full of humor! +1 – If you’d like to win one of these fabulous books, please leave a comment below. Please leave your comments/follow the Pinterest Board/let me know if you’ve posted 50 or more PPBs etc. by Sunday June 15 at 5 PM EDT. Names will be entered the appropriate number of times into random.org and 9 winners will be randomly chosen and matched with the books. My deepest thanks to all the bloggers who have supported this effort so whole-heartedly, and to all the readers who come by to share our love of picture books every week! Perfect Picture Books would not exist without you! PPBF bloggers please be sure to leave your post-specific link in the list below so we can all come visit you one last time before summer! Prize Winners AND Summer Plans! Thanks, Joanna! You are one of the true original members of PPBF. 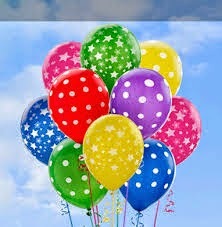 You may have even posted more books than I have since I've skipped a couple weeks and recycled 4 books 🙂 You never know when you start something how it's going to turn out, but PPBF has certainly been wonderful on so many levels, and I'm so grateful to you and everyone who make it what it is! This is such a fun book, Sue! I hope you get a chance to read it 🙂 And truthfully, I think you have to be a lot braver for math than for rock climbing 🙂 I'm not sure of your exact number either, but it must be close to 50 if not over – you are a long-standing member of the PPBF community! 🙂 Thank you so much for all you've done for our list, with all your terrific books and reviews! Sounds like you need an assistant! But if that's not possible, hopefully extra chocolate helps! A break sounds WONderful – though I'll certainly miss your posts (and your CHOCOLATE!). Enjoy your family and all that. You've started a wonderful thing here, Susanna. Here's to the next 100 weeks! You go and HAVE that well deserved summer break you chocolate lover you. And maybe, just maybe, I might lose some weight not having to eye up all those delicious mouthwatering hip loving treats you keep teasing us with… haha…. Have fun in the sun sweet lady. And a big thank you for all you do. Great title; Nadine does sound like spunky cow. Congrats to you and all the bloggers. I enjoy learning about new pbs! I am now following all your pinterest boards. Love how you categorized the picture books on Pinterest! I am interested in Mitchell goes Bowling or Watermelon Seed. Haven't read those yet. You can be sure I am adding I AM COW HERE ME MOO! To my list of to-read books! 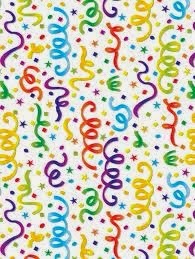 Congratulations on your centenni-post, Susanna! You chose a great book as your 100th perfect one. Nothing like a spunky cow to make for a good read. I love Jill Esbaum's books. Have a great summer! This is awesome, congratulations on ONE HUNDRED WEEKS! Hi Susanna: Wow! One Hundred Weeks! Such a wonderful accomplishment. 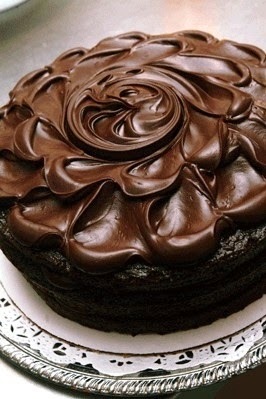 Time to celebrate; with chocolate, of course. 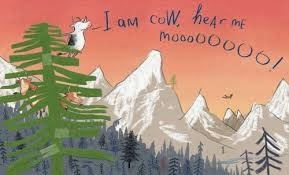 I Am Cow; Hear Me Moo, sounds like an excellent book about courage. Don't you just love Pinterest? I am now following your Pinterest boards. Happy Summer. Hi Susanna! Way past the deadline but wanted to say congrats. CONGRATS! You've helped people find perfect picture books–and each other–for over 100 weeks! That's awesome. And deserving of your own chocolatier. Thanks, Suzy 🙂 Glad you like the look of the book, and I do love Pinterest – I could spend WAY too much time there drooling over desserts 🙂 Thanks for following! I hope you are able to get caught up on all your “stuff” and still have time for your writing. 101 weeks of Perfect Picture Books? That's definitely something to moo about! I love Jill Esbaum's work and I AM COW looks like tons of fun!